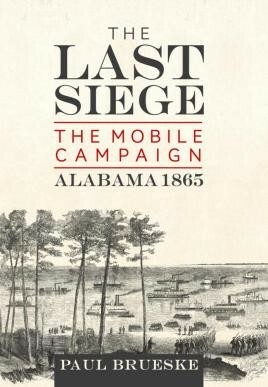 A new study of the 1865 Mobile Campaign, exploring events surrounding the Union's siege and capture of Mobile, a battle which ended the Civil War. It has long been acknowledged that General Robert E. Lee's surrender of the Army Northern Virginia ended the Civil War at the battle of Appomattox in April 1865. But even after that battle, Union leaders were not certain the rest of the Southern armies would lay down their arms. The oft-overlooked siege of Mobile was crucial to securing a complete victory and the final surrender of the last Confederate force east of the Mississippi River. After the fall of New Orleans in 1862, Mobile became the most important Confederate port city on the Gulf Coast. In 1864 Union forces won the battle of Mobile Bay, but failed to capture the city of Mobile. Mobile remained an important logistical center, with access to major rail lines and two major river systems, essential in moving reinforcements, ordnance and other supplies. By late 1864, Mobile was one of the last significant Gulf Coast cities east of the Mississippi still held by the Confederacy. A lynchpin in the ability of the Southerners to continue fighting, Mobile's capture became one of the keys to ending the war. The Last Siege describes the entire campaign of Mobile in spring of 1865, from Union and Confederate camp life in the weeks prior to the invasion, through cavalry operations, the Federal feint movement at Cedar Point, naval operations in Mobile Bay, the tread-way escape from Spanish Fort, to the evacuation of Mobile. It overturns the popular notion that Mobile was predominantly a pro-Union town that wholeheartedly welcomed the Federals. It also uses a variety of primary sources to highlight the bravery of the men who fought in this important campaign, which culminated in the final surrender at Citronelle on May 4, 1865.